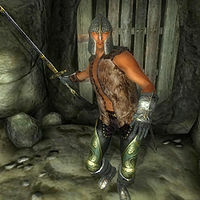 Nedhelfin is a Bosmer nightblade who is hiding out with his fellow thieves in Hrota Cave, just north of Anvil. Nedhelfin has leveled light boots, gauntlets, two pairs of greaves, a helmet, and a shield. He wields a leveled longsword in combat. He also wears a huntsman vest, huntsman leather pants, and a pair of huntsman moccasins. He also carries a moderate sized amount of gold. Nedhelfin has the ability to use a leveled set of nightblade spells. Nedhelfin waits in one of the first chambers of Hrota Cave all day and night, without sleeping or eating. He will attack on sight without explanation, and will accept no yield. Defeating him is necessary to advance the quest Den of Thieves for the Fighters Guild.